Superdinosaur Superdinosaur, reptile of steel, was an alias for Fresco-Le-Raye. 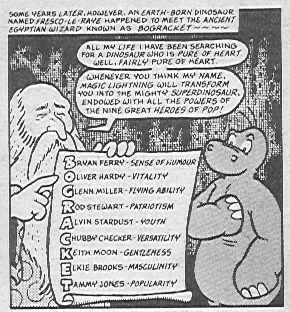 When Fresco accidentally killed himself, Superdinosaur survived, of course! To change from one to the other, Fresco simply had to think BOGRACKET in a telephone booth. BOGRACKET is now used as a hashtag.